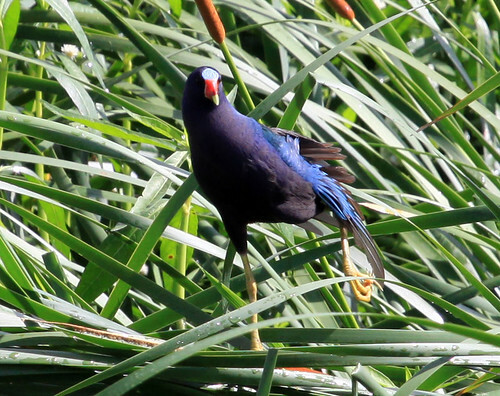 Laura's Birding Blog: Purple Gallinule in Duluth?! On Friday, September 23, the nice people at Loll Design in West Duluth found a weird-looking bird that had apparently hit one of their windows. They’re near the St. Louis River, and this was definitely a water bird, but one that belongs a couple of thousand miles south of here—a young Purple Gallinule. They brought it to Wildwoods, a wildlife rehabilitation clinic in Duluth. Purple Gallinules are shockingly cool birds, with incredibly long toes designed to balance the birds on lily pads in southern and tropical marshes. Adults are a wonderful purplish blue and green, with a shiny red bill and powder blue forehead plate and a tiny triangular tail lined with white fluff. Young are a softer brownish with a lovely greenish cast to their wings, and those amazing long toes. I saw my first in South Carolina and Georgia in 1976, when they were wonderfully easy to spot, but their numbers have declined significantly in recent decades. Purple Gallinules breed in the Americas in the Lower Coastal Plain of the Gulf States and along the Atlantic seaboard to South Carolina, and down through South America. 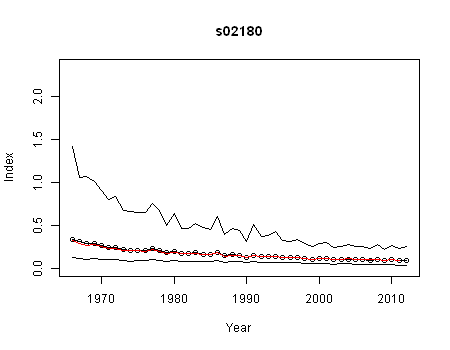 They’re also found along rivers extending up the Mississippi River Valley as far as Arkansas, and other river systems into Maryland and Delaware—these inland populations are declining rapidly. That's at least where they belong, but this is a species known for “vagrancy”—the term ornithologists use when individuals of a species wander beyond their expected range. There are odd records of individuals found as far away as Europe, Antarctica, and South Africa, and in the Americas as far north as Canada—one pair actually nested up in central Ohio in 1962 and successfully reared young—that report was written up in The Auk in 1964. 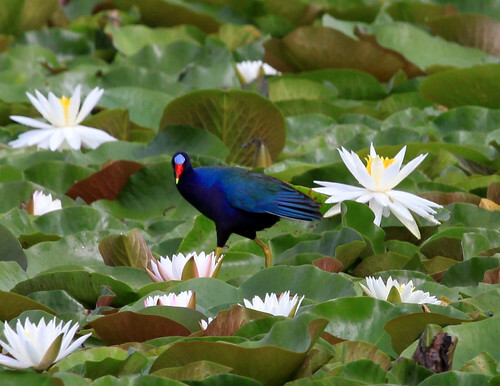 Minnesota has three previous records of Purple Gallinules in the state. On November 11, 1963, Ray Jasko found a dead immature male in an open field near Toivola. The bird showed no signs of injury. An adult was found dead in Sheldon Township in Houston County in June 1967, and lies in state at the Bell Museum of Natural History. Then on September 5, 1970, Don Bolduc found a live one, an immature, in a marsh in St. Peter. That was Minnesota’s last recorded Purple Gallinule until this one. Wisconsin has had more records. Four different birds turned up in the spring of 1973, during a time of massive flooding along the Mississippi. The state has had nine other spring records from 1944 through 1983, three summer records, and three fall records, most recently on October 21, 2009. It’s hard to know what prompts individual birds of some families to wander about like this. They're of course functionally illiterate, so they haven't read the field guides showing where they ostensibly belong. Some hummingbirds, ibises, herons and other birds are known to show up in unexpected places during migration now and then but fairly regularly. In spring we assume they simply overshot, but in fall we’re more mystified. This bird’s arrival on Friday may have been prompted by the burgeoning Hurricane Patricia, but that’s just guesswork that can’t be verified. Today, Tuesday, it’s heading south, to Florida, via the Wildlife Rehabilitation Center in Roseville, Minnesota. It’ll wander among the lily pads, lifting some up along the edge to pick off insect on the undersurface, grab some berries here and there, and eat what other seeds, fruits, and grubs it can find. Before release, it’ll be fed up so it’s strong and fit. Only a few remain in Florida through the winter, but in the right habitat, rich with pond lilies, it should have as good a chance as possible. And with luck, when next it takes a long journey, it’ll head in the right direction. Hey!!! The guy who found that bird called the zoo, wondering whom to call. When I asked if he had any idea what kind of bird it was, he said 'some kind of rail'... Which blew me away!! I'm glad to hear that it's ok, and something really unusual! Pretty awesome bird for your area! I can't even imagine. We had one a month ago in Arizona and it was pretty special. Nice bird. Glad they were able to help the bird out.